This post was originally posted in May 2015 and has been updated and reposted in January 2019. 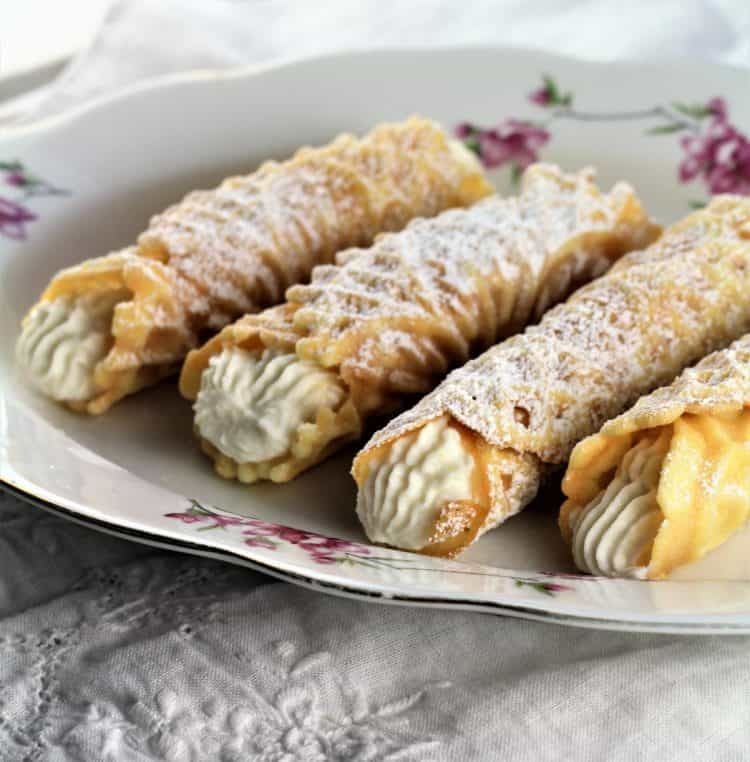 Pizzelle Cannoli with Ricotta Filling, a delicious alternative to traditional cannoli. Especially when you want to enjoy your cannoli in a hurry! 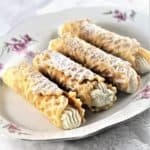 Pizzelle Cannoli with Ricotta Filling, another of my favorite ricotta filled desserts! 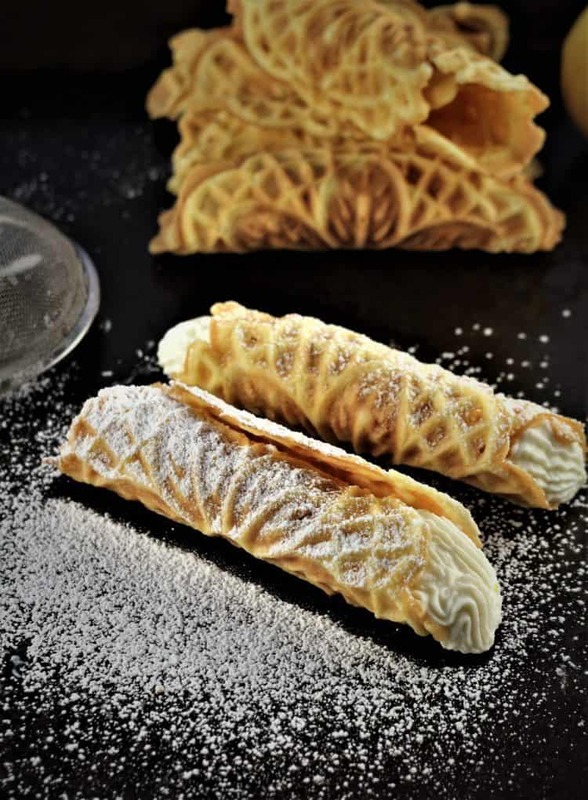 Some of you may be thinking that nothing can replace your traditional cannoli shells. Of course I will agree with you, especially since cannoli are my favorite Sicilian dessert. 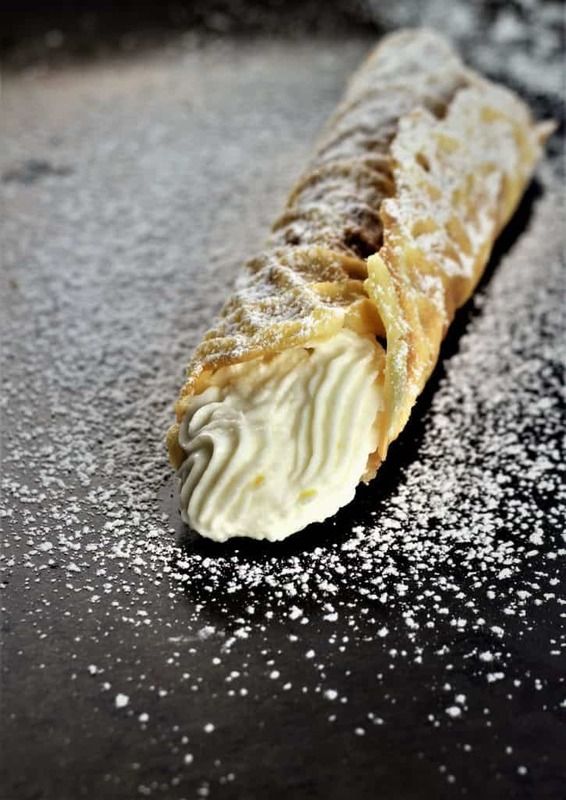 In fact you’ll find my mother’s authentic Sicilian Cannoli recipe on my blog. While I’m all for maintaining tradition, I’m definitely open to variations on recipes that I love. Let’s face it, sometimes you just don’t have the time to roll out the dough for cannoli shells. You may also be trying to be more health conscious and don’t want to do as much frying. It was my mother who first introduced me to this shortcut for making cannoli a few years ago. You have all the flavor of cannoli you love with less work. And, they do look quite pretty as well! 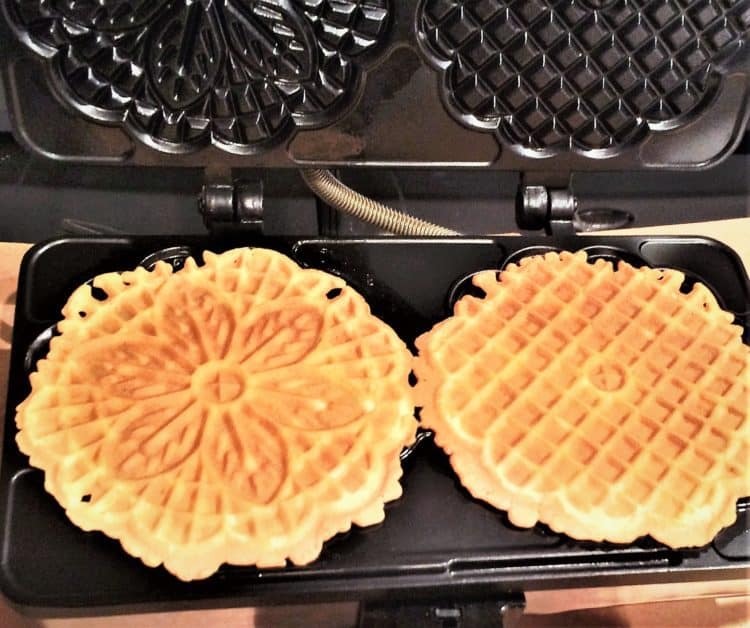 Pizzelle are flat, crisp waffle like cookies made in an iron which is similar to a waffle iron. 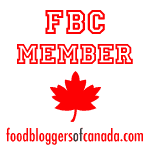 They are quite affordable and you can find a link at the bottom of this post for a pizzelle iron. I purchased one for my mother’s birthday a few years ago and the return has been quite advantageous! I recently joined her for a pizzelle cannoli making session. Make the pizzelle batter by combining all the ingredients listed in the recipe below in one bowl. Preheat the pizzelle maker and pour the batter very much in the same way that you would make waffles. Wait a minute and remove the pizzelle when they are golden in colour. 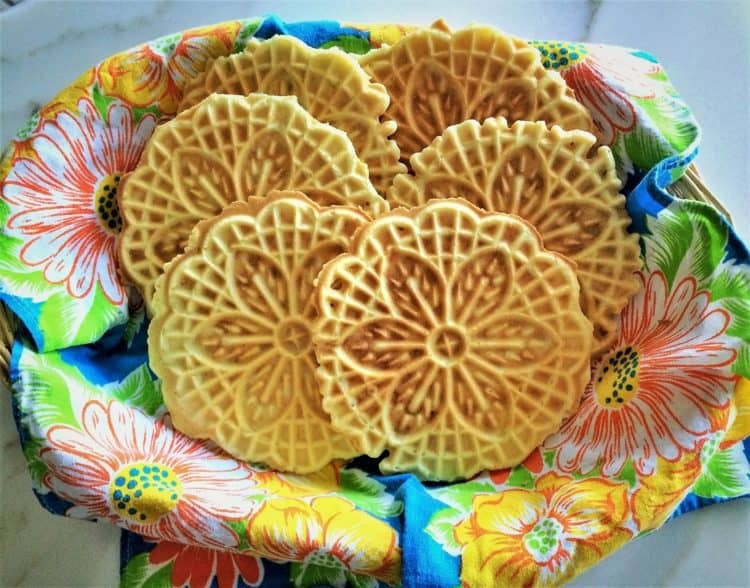 The trick to making these pizzelle shells is to roll them right away when you remove them from the iron. They harden quite rapidly so you will probably only be able to roll one out of every 2 pizzelle. That is unless you have an assistant! 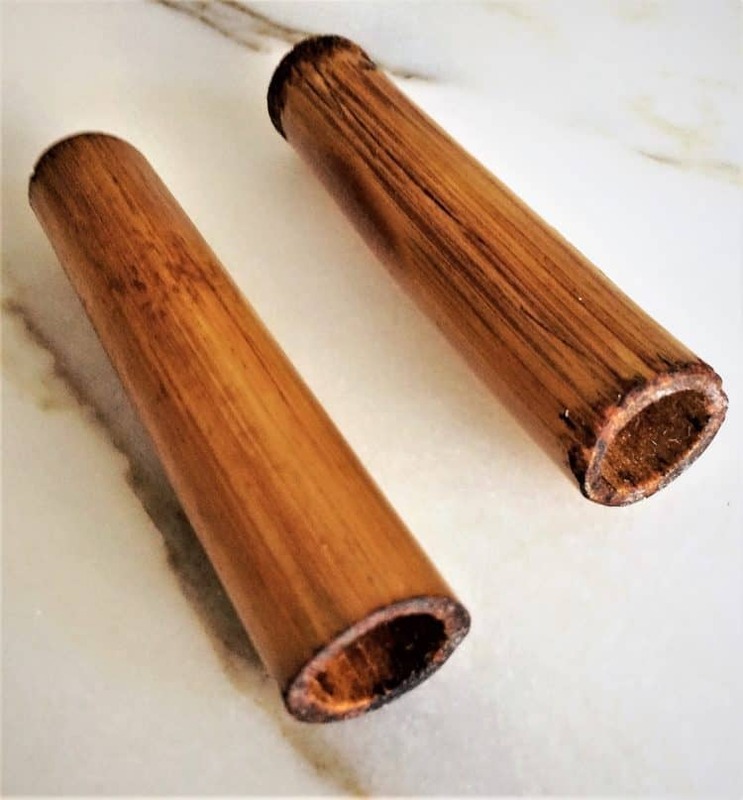 My mother uses these bamboo cannoli dowels to shape the pizzelle. These are what she uses to make the traditional fried shells. Stainless steel versions are also available on Amazon. In my research I came across some sites that suggest you cut off pieces of a wooden broom handle, which you would have to probably sand before using. My filling of choice, of course, is ricotta but custard is another option. In order to prevent soggy pizzelle, I recommend that you fill them right before serving. The shells will keep in a well sealed container, in a cool dry place for weeks. Simply scoop your filling in a pastry bag, then pipe the ricotta into both ends of the shells. If you don’t have a pastry bag, a freezer bag with the tip snipped off will work as well. Finally, dust with powdered sugar and serve! I think you’ll agree that these are a perfect variation on traditional cannoli. Give them a try and if you do, please don’t forget to take a photo and tag me with #mangiabedda on Instagram and Facebook. Buon appetito! 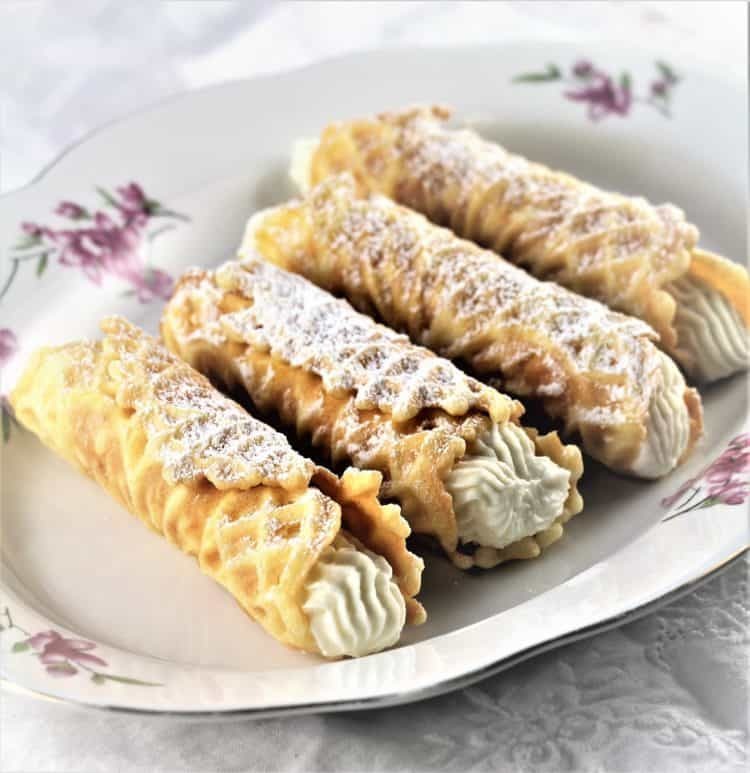 Pizzelle Cannoli are a great alternative to traditional cannoli, and there's no frying involved! 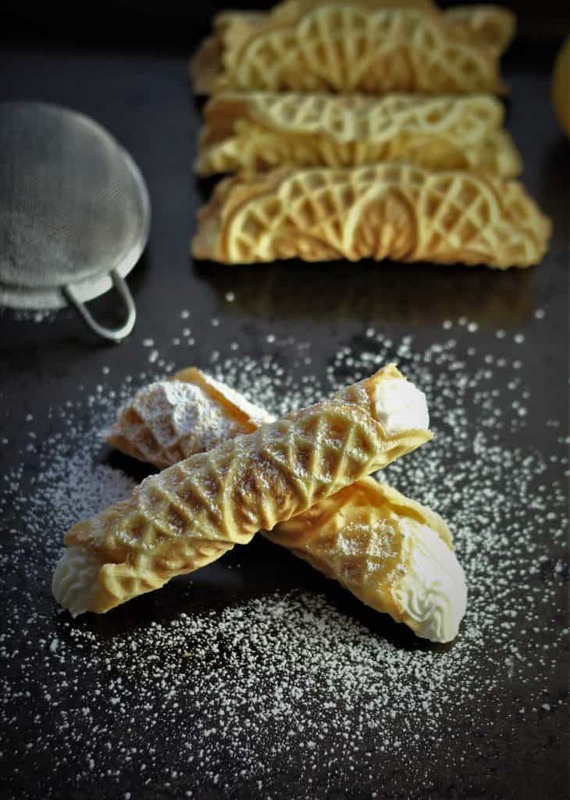 A crispy pizzelle shell is filled with creamy, sweetened ricotta. Preheat the pizzelle iron. To make the batter, combine all ingredients in a large bowl and stir until combined. The batter will have a slightly thicker consistency then a pancake batter. When the pizzelle iron is hot, place about 1 tablespoon of batter per pizzelle on the iron. Cook until pizzelle are a light golden color, about 1 minute. 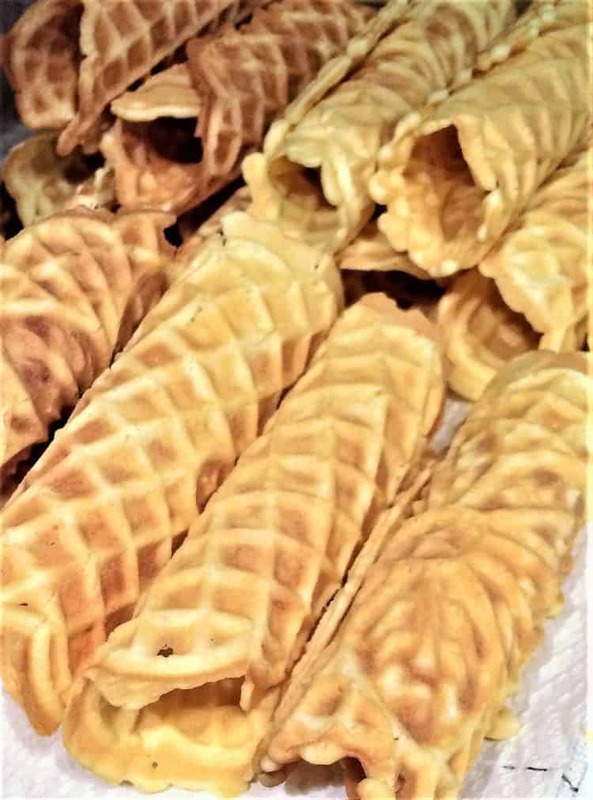 When they are ready, unmold hot pizzelle with a spatula and immediately wrap around the cannoli form. As they set rather quickly, it is realistic to mold one out of every second pizzelle. Save the others to eat as is. To make the filling, combine all ingredients in a bowl and mix well. Whisk until smooth. Right before serving, fill a pastry bag with the ricotta mixture and pipe each pizzelle shell from both ends until full. Alternately, fill a medium sized freezer bag with the filling and snip off the bottom corner to make a small hole for piping. Before serving, dust with powdered sugar. The pizzelle will begin to harden right away when removed from the pizzelle iron. Shape using a cannoli mold immediately. In order to prevent filled pizzelle from becoming soggy, fill them right before serving. The shells will keep in a well sealed container, in a cool dry place for weeks.